Frances is a modern dance performer struggling to make it in New York City. She remains stuck in her life, chasing her dream while everyone around her moves on and up in their lives. "Frances Ha" is directed by Noah Baumbach, who also wrote the film along with Greta Gerwig, who stars as the titular Frances. Both Gerwig and Baumbach are known for making indie New York hipster intellectual comedies such as this. They aren't films that typically have mass appeal but draw in critical praise and a certain demographic of arthouse and film festival fans. Both Baumbach and Gerwig's works have been hit or miss with us, but we feel this film hit its mark very well. It shows the struggles of post-college life in a very frank and accurate manner, especially for those who are chasing an artistic dream but lack the aptitude to truly excel in it. Frances finds herself in increasingly worse off circumstances when it comes to housing in New York City. She is very unwilling to compromise when it comes to her dream and often makes poor decisions. She goes from sharing an apartment with her best friend to renting a single bed in a living room from an acquaintance for the low, low price of $900 a month (though she should be paying $1200/month.....WOW). Eventually, she has to put all of her stuff in storage and go back to living in a dormitory at her alma mater as an RA. The movie also speaks about competition amongst friends and how constantly striving to be the best at something with no compromise can drive friendships, relationships, and families apart. Greta Gerwig is a charming actress with a certain quirky, unique, sometimes nerdy appeal. She has an awkwardness about her that comes out naturally in each of her characters. Frances as a character is a person who feels she should speak with confidence about stuff she really knows nothing about, and this often gets her in trouble. Gerwig is simultaneously self-righteous and endearing, chic and modern. 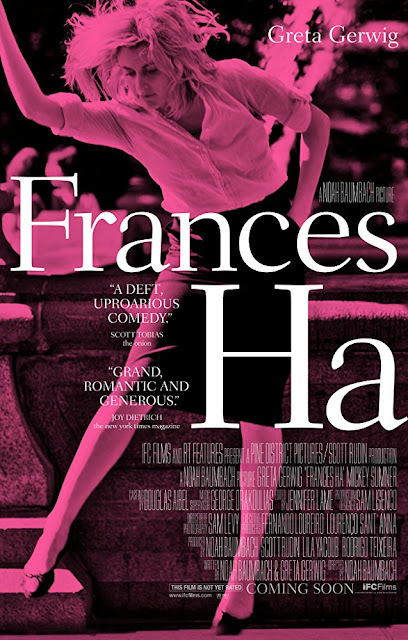 "Frances Ha" is a funny movie, but it doesn't necessarily have the type of humor that will make the audience roll on the floor with laughter. It's filled with moments and situations that are ironic and lively. It will speak to a specific type audience who blossom and buzz with a naive immaturity and an honest to god passion. It is full of some great, wry dialogue that will draw in a chuckle while being mixed with some dramatic themes for good measure. In the end, "Frances Ha" does a great job of capturing life in New York for this very specific subculture.